Hi friends! Would you all like a recipe for soft, sticky, gooey, delicious pumpkin cookies? Yes? I thought so. Well, you’ve come to the right place! Here’s a recipe inspired by, yet again, the almighty pumpkin. But I’ve taken it to a whole new level of deliciousness. I heard that Chicago Soy Dairy was doing a Dandies giveaway for VeganMoFo and I thought, well hey, I should make something with marshmallows! And so this recipe is partly inspired by that and partly inspired by wanting to make something with adult flavor — that is, something big on pumpkin spice flavors — but that also appeals to kids. And since no one is ever too old to enjoy marshmallows and chocolate, I thought this would be the perfect time to bake some cookies! I’ll have to admit, at first, I was a little scared of trying this one out because I knew the marshmallows would basically become “fluff” (which is a popular non-vegan brand name for marshmallow creme). And although I like marshmallows, I’ve never liked them in spreadable form. Also, I knew that the cookies might break apart or flatten out because the marshmallows, under high heat, would dissolve. And so…they did. What came of it was an explosion of wonderful, gooey, sugary heaven. Some of the cookies “popped” like volcanoes and so weren’t as pretty, but once you put one in your mouth, it doesn’t matter what a cookie looks like, right? 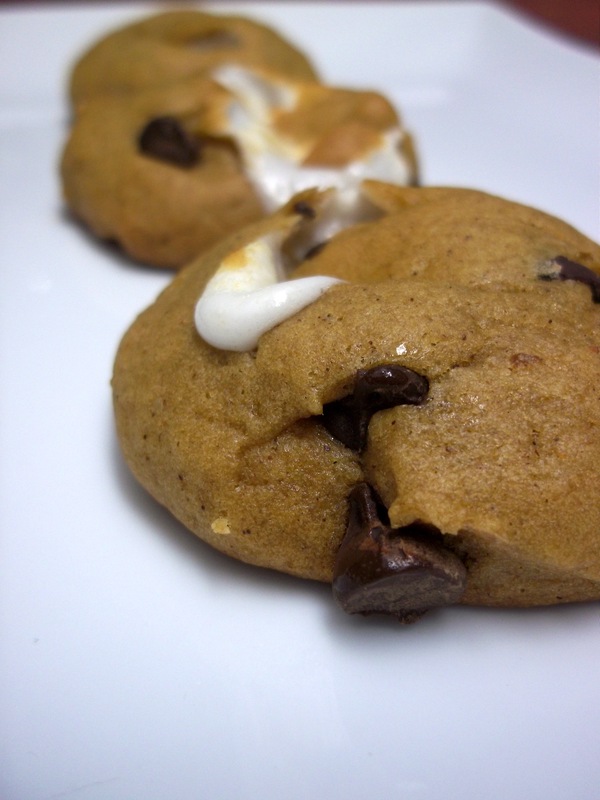 Nonetheless, many of the cookies were “presentable” and many of them were hard to resist on appearance alone — who can resist something that’s basically oozing with marshmallowy sugary goodness? Obviously, only a crazy person can. And none of us are that sort of crazy now, are we? I hope you’ll enjoy these as much as my family and I did. To give you fair warning: when you take them out of the oven they will be a gooey mess. So make sure to space them properly on the baking sheet so that they don’t stick to one another. Also, I decided to store these in the refrigerator so that they wouldn’t become too soft if left out for a long time (I made so many, I couldn’t possibly eat them all myself, and I live alone). If you’re just going to devour them all right away, then there’s no need to refrigerate them. Be sure to check out my other marshmallow treat that uses Dandies Vegan Marshmallows: S’mores Pops! Enjoy! Preheat the oven to 325 F and place a rack in the center of the oven. Line two baking sheets with parchment paper. Set aside. In a large bowl, combine the flour, baking soda, baking powder, spices, and salt. Set aside. In another large bowl, cream together the Ener-G eggs and the sugars, with an electric mixer, until light and fluffy. Add in the Earth Balance butter, vanilla extract, and pumpkin and beat until well combined. Add the flour mixture, in batches, and beat until just combined. Using a rubber spatula, fold in the marshmallows and chocolate chips. Drop the cookies onto the parchment paper lined baking sheet, by the heaping tablespoonful spaced about two inches apart. 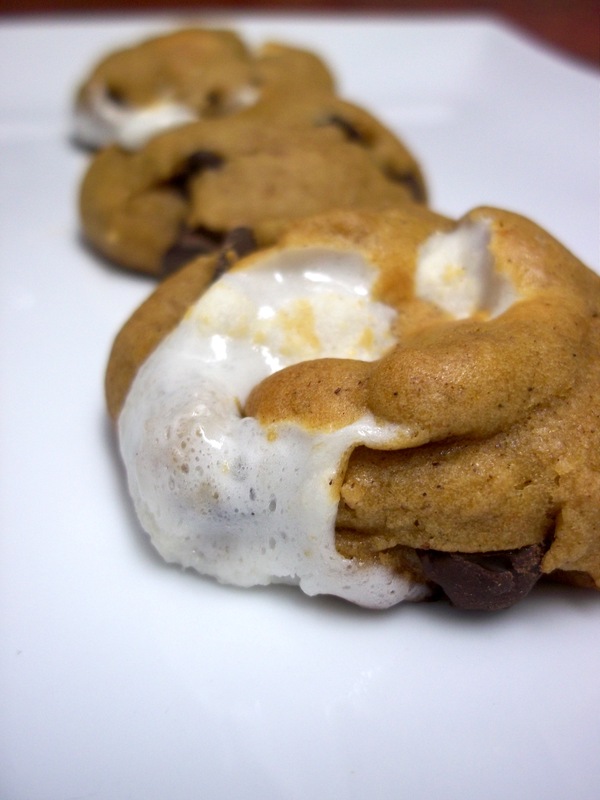 You will want to make sure that each scoop gets at least one marshmallow in the middle of the cookie. The batter will be sticky so you may need to moisten your hands and roll the batter into golf ball sized balls before placing them on the baking sheet. Bake for 15 to 18 minutes or until a toothpick inserted in the center of a cookie comes out clean. If it comes out marshmallowy, then try testing an area as close to the center away from the marshmallow. Remove from oven and transfer to a wire rack to cool completely. Store cookies in an air tight container. I’m glad these were delicious! I just found Dandies at the store down the street. I bet the explosive ones are the best ones! You know, they actually were! They looked like an organized disaster, but they tasted perfect and were more fun to eat! You’re welcome! They do seem like a nice fit for Halloween celebrations! I hope you enjoy them! Thanks, Jess! I just took a look at your blog too. Your recipes are mouth-watering! I can’t wait to try some of them! Oh goodness – yes please! Melody, I have these in the oven right now! I skipped the marshmallows this time, though (I know all about cookies with marshmallows, they are YUM) because I was feelin’ more like a pumpkin cowboy cookie sorta thing (I added chopped walnuts, coconut and chocolate chips to mine). Can’t wait until they are done!!! Found you in the MoFo feed and very glad I did. Beautiful blog, our tastes are very similar! P.S. Would you mind if I blogged these (with credit and link-back, of course)? Thanks for the compliments! Your version sounds absolutely divine! I adore cowboy cookies! I hope they came out well! And, yes, you can blog these! I’d be very honored. You’re welcome, Dawn! I’m glad they came out well! I’ll have to definitely try them “Cowboy Cookie” style next! What wonderful inspiration, thank you! Hmm. That’s odd. Did the cookie bars come out okay? They were pretty moist and sticky, but still tasted delicious. I’m not sure what went wrong! I’d gladly attempt them again though.